This is just a selection of the business events, training, and seminars happening around Norwich in January ….. If you have challenges in your business, your career, your relationships, or you lack clarity, direction, confidence, or time, then this course could help you to make a quantum leap in your performance and results. This two-day training event will help you immerse yourself in one of the most powerful mind-training programmes available today, where you will learn and understand how peak performers, in all fields, use brain-training to achieve goals and dreams. To discover more about Mindspan visit their website, or telephone 01603 819131. Nigeria is a middle income, mixed economy and emerging market, with expanding financial, service, communications and entertainment sectors. As of 2012 Nigeria is the second largest economy within Africa and is on track to become one of the 20 largest economies in the world by 2020. Norfolk Chamber of Commerce is delighted to be working with experts covering high growth markets of which Nigeria is one. Invited guests and speakers will be made providing you with a great deal of information, to help with your decision on whether to take steps to begin trading with this dynamic market. If you have never exported before, or dabbled a little or are an experienced exporter, please come along. This could be a market that makes a huge difference to your business. The event is free to attend however there is a need to cater for all delegates, so please ensure to book your free place here. Business Equip will then develop the site ready for the second day when training will be given in how to keep your site up-to-date. It is essential you attend both dates. For more information and to book a place visit the website. Join the Norfolk Chamber for an afternoon of accessing specialist knowledge essential for any HR Professional or business owner. Employment law is a fast paced and constantly changing area of law that requires those involved in the sector to keep themselves abreast of the latest developments. This HR Forum aims to help by focusing on cutting edge developments in Employment Law to ensure you are up to date on the latest developments. It will provide an overview of the changes throughout the last year and their impact, and will look ahead at what is on the horizon. Delegates will be actively encouraged to get to grips with issues that arise and affect their sector in an interactive and enjoyable way. Sponsored and delivered by Cozens Hardy LLP. Lessons learned from previous decommissioning activity will be used throughout. The training will be led by 3 industry personnel who have a vast wealth of knowledge on the Decommissioning Industry in the Oil and Gas Sector. Please see website for more information and to book places, or contact Jennifer Mann on jmann@decomnorthsea.com if you have any further queries. EEAV EXPO 2015 where you can see, touch, and be changed by the products and trends driving education and corporate technology, finding the right type of advanced and fundamental tech to help you overcome and profit from changes in industry. Covering audio, video, control, automation, networking, energy management, and more, this event will be of interest to all technology professionals, no matter their service focus. 3hr Workshop. Book via website. For more information and to reserve your place visit the Sandler Training website. £79 per half day workshop. Book a half day or a whole day. 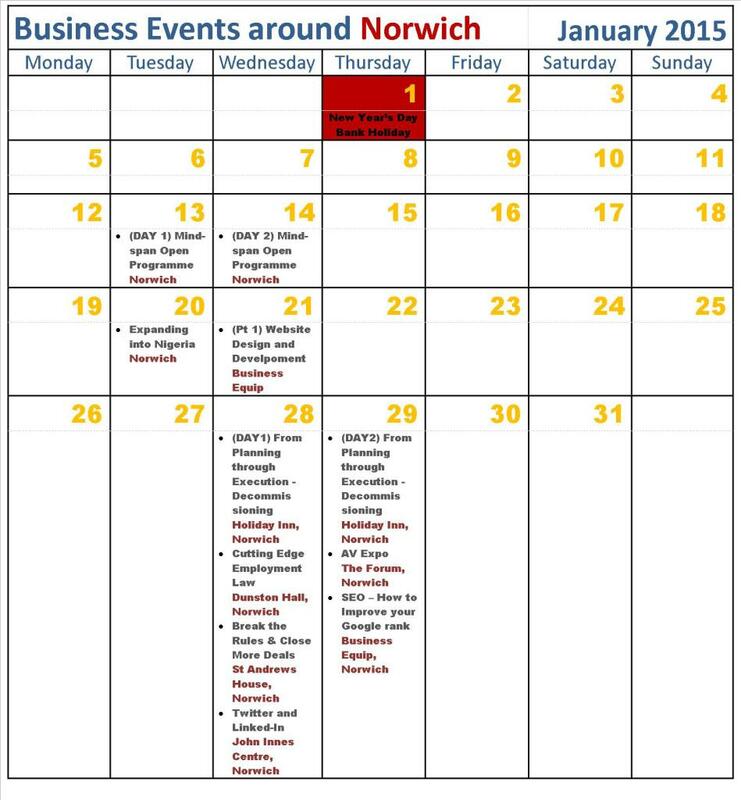 If you have any events in the Norwich region in January that you’d like to promote please let us know in the comments below ….